Kyoto to host 3rd "Rimpa Rock" festival in Oct. The third "Rimpa Rock" festival, produced by Kyoto-based painter Hideki Kimura, will be held at the Heian Jingu shrine from 6 p.m. on Oct. 12. Scheduled to take part are 24 groups of singers, choreographers and other artists, including Heian Gagaku Kai, a band using ancient Japanese musical instruments, Yamato no Hibiki Kyo, who play Japanese "wadaiko" drums, chanson singer Wasaburo, and MDP Masaki, who performs dances of the late Michael Jackson. 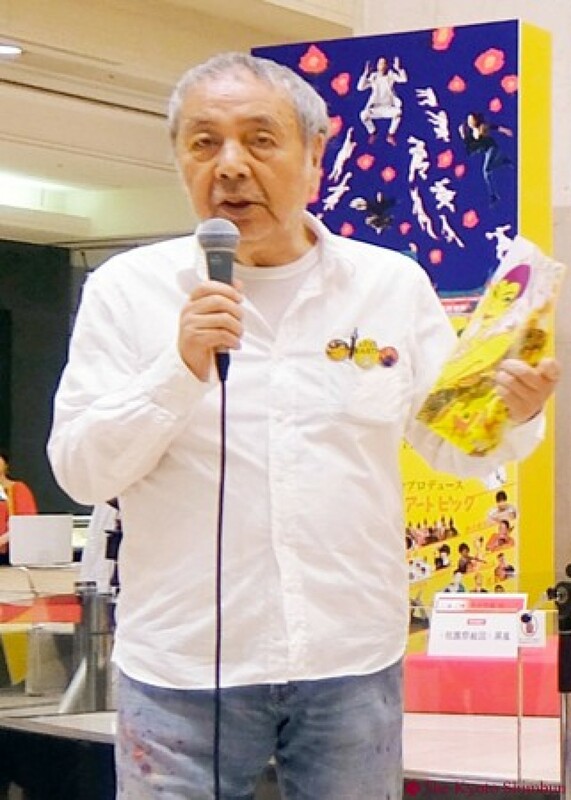 Recently at the Kyoto Takashimaya department store, Kimura, 76, whose nickname is Ki-yan, explained what Rimpa Rock is about, surrounded by his own artwork -- a folding screen -- on the occasion of the traditional Gion festival. MDP Masaki and all-girl dance group DTG performed to promote the festival. "We are doing this without thinking about gaining profit," Kimura said of the event that brings together selected artists. "We want many people to come see our performance." Advance tickets are available for 5,000 yen. Rimpa Rock was first held in 2015, which marked the 400th year since the birth of Rimpa, one of the major traditional schools of Japanese painting, at the Alti hall of Kyoto with the aim of taking Japanese pop art to the world and doing what Tokyo cannot do toward the 2020 Tokyo Olympics. Looking back at the inaugural festival, Kimura said, "It was at a time when the initial design of the Tokyo Olympic logo faced (plagiarism allegations), so I thought we couldn't count on Tokyo to spread information about our country." The second Rimpa Rock took place in 2017 at Miyagawacho Kaburenjo Theater.